Put a touch screen in their next Retina MacBook Pro (MBP) and MacBook Air (MBA). Get rid of the 15 MacBook Pro the same way they got rid of the 17" MacBook Pro. Put a Retina screen in the MacBook Air and keep the prices the same as they are now. Increase the hard drive size for Retina MacBook Pro so they don't complete with the MacBook air. For example, start the MBA out with 128GB and top out at 256GB and start the MBP at 256GB topping out at 750GB. Not introduce a touch screen when they update the MacBook Pro line. Wait until the next MBP and MBA refresh (2014) to introduce touch screens. Keep the 15" MBP around for another cycle. Not lower the cost of the MBA to compete with the Microsoft Surface. Lower the cost of the Surface RT immediately to $500 with Touch Cover for the 32GB version. Package the Surface Pro with the Touch Cover and Office365 for the current prices of $899/$999. Beg and plead developers to create or port Modern UI apps. Create an option for a 256GB Surface Pro and delete the 64GB version. Keep the Surface RT priced the same for another 6 months before realizing they need to separate the RT line from ultra cheap full Windows 8 hybrids running Atom processors which start around $600. Keep the Type and Touch Covers as sold separately accessories but reduce the cost to $70 and $90. Throw money at developers but sit back and watch as they are slow to develop Modern UI apps because so few Windows RT products are being sold. Why create a Modern UI app when your standard app works on 95% of Windows 8 products? Insist that 64GB/128GB is enough storage and chant "Cloud, Cloud, Cloud, Sky Drive, Sky Drive, Sky Drive" in the background. 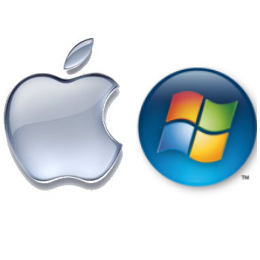 These are just a few of my thoughts on where Apple and Microsoft will or should go in the near future. Neither company will leap head first into where the future is going which is ultra thin, ultra portable, touch screen, hybrid devices that last at least 10 hours on a single charge. Apple will refuse to adopt current trends (touch screens) while refusing to drop the cost of their devices until at least the next refresh cycle after seeing their sales have dropped again. Microsoft will refuse to market their devices according to what they actually are. The Surface RT is a tablet and should be priced less than $500 with the Touch Cover. The 32GB Asus Vivo Tab RT can be had for less than $400 now and even packaged with a Keyboard for less than $500 after starting at $599 for the tablet with a free keyboard option. This is where Microsoft needs to take the Surface RT. The Surface Pro needs to be packaged with the Type Cover and come with 1 year of Office365. This will get a lot of people to jump on to the Surface platform because of the extreme savings it can offer. Once you have people sucked in with a year of free Office365 they will have no choice but to pay $99 the next year to keep the same services. Also the Surface Pro already competes directly with the 11" MacBook Air in terms of pricing (when you consider you have to purchase a keyboard just to be productive) and portability so if you offer the benefit of free Office365 along with 256GB hard drive option for $1000, you have an automatic winner. If Apple does what I think they will do in a year and make the 13" MacBook Pro their entry level ($900) option into the OSX ecosystem, they will have a device that Microsoft or any of its OEM partners can't compete with right now. Microsoft devices like the Lenovo X1 Carbon and Samsung Series 9 already compete directly against the Retina MBP computers so it will be up to them to make their lower end device better to compete with Apple's entry level product. These are just my thoughts after my earlier post from the coffee shop and seeing so many people using behemoth laptops huddled around the wall outlets. The future is now people. There is no reason to bring your 15" desktop replacement computer to the coffee shop and bring the AC adapter as well. I did everything you were trying to do on my Surface RT and I didn't have to worry about my battery. After about 3 hours of constant use, I still have 67% of my battery left.